To the Chinese, tea is a divine soft drink that discharges tiredness of toil and brings renewed vigour to work. For Bangladesh, it’s also an influential cash crop. But in recent exporting items list, tea is dwindling annually. There are several reasons of decline of tea export in Bangladesh. Currently tea is being cultivated in limited areas, moreover tea consumption in the country is increasing at a rate of 3 per cent but production growth is 1.23 per cent annually. Tea is now a major export item but the country will soon turn into an importer if this trend continues. The tea research institute of Bangladesh (BTRI) has developed around 20 types of variety to ensure maximum amount of production throughout different regions of our country. Recently 4 districts of Panchgarh, Lalmonirhat, Thakurgaon and Dinajpur have been brought under tea cultivation. Still, we will fail to meet the future shortfall in national consumption. 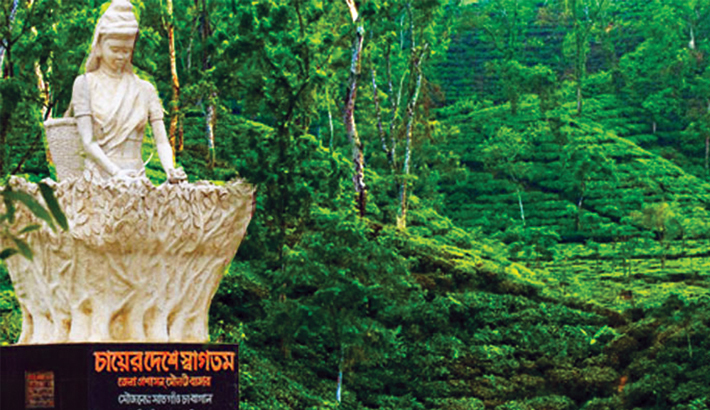 Till now there is no variety invented or developed to enable tea cultivation in coastal regions. But if it can be done, then the production may boost and we may get a long green barrier along the coastline. That is also a crucial demand for the safety of our beloved motherland. We lost a lot of forest lands of pleistocene period highlands. If suitable HYV tea can be developed for these regions, then we can hope for an economical afforestation on these deforested areas. Thus there are huge possibilities of increasing tea cultivation strategically. Actually it has little obstacles and barriers. We need some experts in this sector so that we can exceed the production rate beyond rapid growth of national consumption. Now only Shahjalal University of Science and Technology, Sylhet, offers graduation on “Food Engineering and Tea Technology”. Recently under the supervision of Dr Iftekher Ahmed, SUST introduced the first experimental tea garden in campus. According to soil scientist Dr Mojammel Haque, “Implementation of modern innovative technology in field and industry is crucial to compete with the competitors”. For instance, maintaining a convex plucking table may increase the tea bud collection. And also using developed technologies in field and processing industries is essential. Belonging to a humid environment, Bangladesh goes through huge pest attack on crops. Tea is no different to it. Tea crop is attacked by several complex types of pests, mites, nematodes, microbes. We lose around 15 per cent of tea crops to pest and disease. That means we lose 11.85 million kg of tea due to pests and attack by other organisms. Using biotechnology can be much more promising, cheap and organic. In fact we import huge amount of chemicals. Usage of biotechnology can cut expenditure by organic farming process. 2017 saw the 2nd largest production of 79 million kg of tea but that year we had to import around 7 million kg of tea. Cause domestic consumption was around 4296 cups per head. Value addition is implemented. But it’s not the one permanent solution. Actually national consumption is a sign of national development. New innovative strategies should be implemented. Climate change is another problem. It has reduced the quantity, quality and increase in pest and disease. It may affect more if precise measures are not launched from now. Finding and capturing new markets is also a big deal. For example, we may seek attention of Canadians, Slovakians and Russians to switch to tea from coffee. To ensure this, we should emphasise on organic tea cultivation with a labour friendly hygienic environment. India’s Laxmi Tea Estate produces ‘silver bud imperial tea’, which costs around USD 400. China is producing panda dung tea from November 2011. This tea costs USD 70000 per kg. This type of green tea has a nutty taste. Discovering tea of different taste, flavour and appearance can seek attention of foreigners, so that we can export good quality tea and also maintain national demand of tea. If we can add quality of tea then it may bring more revenue. It may also increase jobs in this sector. Besides this, if possible Bangladeshi companies can also start business in foreign countries where harvesting times are same or different so that we can literally double up the production. By implementing this method, we can also grab native markets of foreign producers. It may be also a fantastic business strategy to combat climate change. Another threat is illegally cutting down of hill tracts, which are near future crop lands and mines. Government must be very strict on this concern and also about smuggling of tea. Government should be more serious about tea sector. In budget government should increase fund for tea sector development. Increasing tea cultivation will not only enhance export but also increase jobs and influence of tea in National GDP. So it is high time the authority and experts together launch required initiatives to bring a turnaround in tea export.